Time and the erosive force of the Noguera Ribagorçana river crossing the Montsec range have carved out one of the most spectacularly wild places in Catalonia, the Mont-rebei gorge. 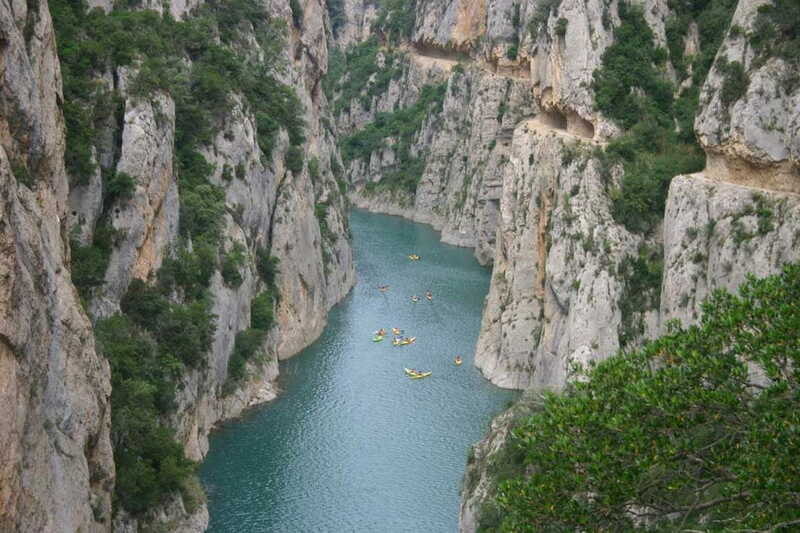 This separates Montsec d'Ares from Montsec de l'Estall and is a natural frontier with Aragon, with vertical walls reaching up to 500 metres and points where the minimum width of the gorge is only 20 metres. It is only crossed by two paths partially dug out of the rock; the first, and lowest, was opened in 1924, built to facilitate connections between the Àger Valley and the village of Pont de Montanyana. As it was flooded by the waters of the Canelles reservoir when it reached its highest level, Enher excavated a new path from the rock which was opened in 1984, above the maximum water level of the reservoir.